Every Friday, I publish an update on my training. This is Update #8. I’m so used to not having hair that I sometimes do stupid things. Earlier this week, I went to a school activity first thing in the morning. Because I’m so used to not brushing my hair, I forgot to do it (I take showers at night, so my hair is wild and crazy in the morning until I tame it). 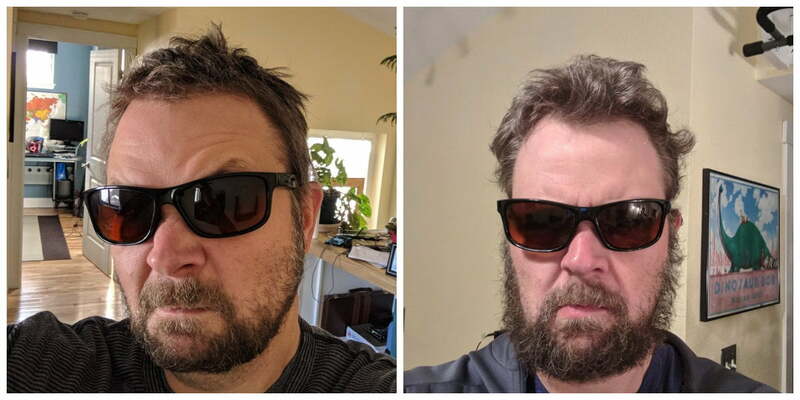 When I got home, I glanced in the mirror and my hair looked 10x worse than the picture on the right. Scary, I know. I’m surprised the school didn’t call the cops. Me: Hi D, how are you? Me: What’s wrong? Why are you looking at me like that? D: It’s your hair dad. You look creepy. I’m going to start calling you Mr. Creeper. The good news is that despite the advanced length of my hair, I haven’t found a need for hair conditioner. I remain steadfast in my belief that hair conditioner is a giant scam. PEEPS ON COURSE! And you know the race organizers are serious because they put it in pink and in all caps! And you know I’m serious because I put it in huge letters and centered it all fancy. I’m at mile 11 with only 2 to go. However, I’m broken and battered. My legs hurt. I’m sweating. I’m cold. Bad words fly from my mouth. Just when I think I can’t go another yard, what do I see? Peeps. Yes, Peeps. It’s at this point that I know I will make it. I grab like 38 of them and stuff them down my throat. Peeps are to me what spinach is to Popeye. I blow past fellow race participants Mr. WoW and JD. I cross the finish line with fists in the air and the crowd goes nuts! …I grab like 38 Peeps and stuff them down my throat. Three minutes later, my stomach protests the decision. Another minute later, I’m on the side of the course, huddled over. Seconds later, my stomach revolts and expells the Peeps, a liter of orange Gatorade and the box of Samoas I had for breakfast. Mr. WoW and JD laugh at my demise. The cops haul me off for public indecency. You know when you’re about to do something stupid, but you do it anyway? It’s every day for me. So yes, I am going to stuff myself full of Peeps while I run. Just for the sake of argument… would you rather have peeps or beer during a half marathon? 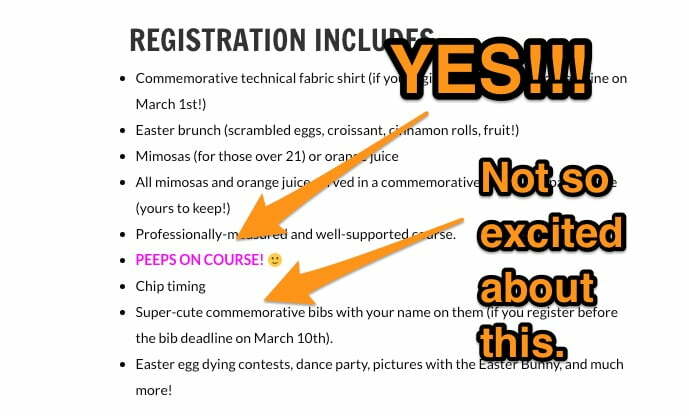 Peeps on the other hand… I’m sorry but I think I’d rather run an extra mile before eating a peep during a race! Peeps during and beer after! But, maybe beer is some magical elixir as you have pointed out? Has anyone brewed beer with Peeps? Best of both worlds! Nooo, this would be good! The Physcian on FIRE brews beer with Sour Patch Kids, so why can’t we have Peep Porter or an APA (American Peep Ale)? Wait, this does sound kinda nasty. Maybe I have crossed a line.? Never mind. If I consume Peeps and beer, I’ll put at least a minute between the two. What could possibly go wrong? Uh oh. I’m gonng get detained at the airport! Dude, no. SHAMPOO is the scam. Conditioner is life. Ha ha! My hair is still short, but does get curly when it gets long. I promise to let it grow another foot (and get super curly) before I pass judgment again about hair conditioner. In things most people don’t care about today: a majority of shampoos contain sulfates, which create the suds people associate with getting things clean, but those sulfates are also incredibly drying for hair. Curly hair in particular tends to be drier, and sulfate shampoo exacerbates this issue. It’s better to use a sulfate-free shampoo or a clarifying conditioner. i ran the last 5 miles of the mardi gras marathon once. i just staggered out the hotel in a satin cheetah shirt and some doc marten shoes and the runners were going by so i joined them. they had beer stops all over the place on that one, being new orleans and all. peeps will work for you! Hilarious! I didn’t know one could actually run in Doc Martens, although I’ve never tried myself! Despite all of that, you’ll still run faster than me! Are you sure that it is the marshmallow peeps on course or did they mean peeping toms? Honestly, I could do without either. I’m with Mrs.AR and have been dreaming about the good craft beer after the race. Less than a month to go, you got this my friend! Yikes! I knew that someone would take it in that direction! And yeah, less than a month to go! That is scary! Just hope the peeps don’t get stuck in your beard…that will surely slow you down. I’ll be slow enough, so any more wind resistance would be a bad thing. Hell, I’d probably start moving backward! How long do you think that beard has to get before they let you join ZZ Top? You prompted me to actually check my resting heart rate…72 bpm. You’ve got me beat at least! To join ZZ Top, I’d have to have some musical talent. If there is anything I’m worse at than running, it’s playing an instrument of any type. That uni-bomber impression is coming along nicely Carl! That’s a good look. I’d do the same, except I’d end up divorced by March 31. I also have none on the top, so it makes it all the more creepy. Well done on the running. We’re almost there, can you taste it? Feeling anxious? You’ll do just fine. As far as the peeps. Can’t be that much different than the Goo packs that people take on these things. And those are disgusting. They even came out with a “Birthday Cake” flavor… GROSS!! https://guenergy.com/ plus just depends on the way the wind is blowing. If they’re caught in your beard, it might act as a sail! Less than a month, now is the fun stuff. We have about three weeks to make sure we get in some 10 mile runs. DO IT! Also remember you’re training at altitude, we’re decidedly not as we run along the beach. so that’s definitely an advantage. Mr. Wow, I notice you haven’t been posting YOUR training update and you seem pretty feisty – have you been sneaking in long runs and not telling anyone!? If we microwave the Peeps they will greatly expand in size and definitely provide some buoyancy and lift! Oh wow, how do I get in on this! I’ll run it in under an hour! I’m sure you are on a qualified training plan but please tell me that it has at least one ten mile run in it if not more than one? Yes, it does. I just haven’t done it yet. It is scheduled for Wednesday or Thursday though. Maybe your hair wouldn’t have looked 10x worse at the school activity had you used conditioner. There must be levels of hair conditioner acceptance based on hair length. Stage 2: Hair conditioner is nice. It’s not necessary but maybe a luxury. It could help. Stage 3: Hair conditioner is necessary. Without it, my hair would be impossible. I’m going to spend the extra dollars and luggage space to have it. Stage 4: I’m stranded on a deserted (not desserted) island and I only have three items. What are they? Water filtration system, matches, and hair conditioner. Ironman Wisconsin course for 3 hours – 60 miles. No running this week. Oops got to get back on that. You should convert your beers per mile measurement into miles per gallon. That way we can compare your efficiency against a Prius.